How am I going to teach my kids to read? This thought went through my head when we decided to home school. The older three kids were taught at school. Now, that we were homeschooling was it even possible for me to teach the other two kids? I went to our local store that carries curriculum. As I was scanning the phonics curriculum, a stranger came up and recommended this book. 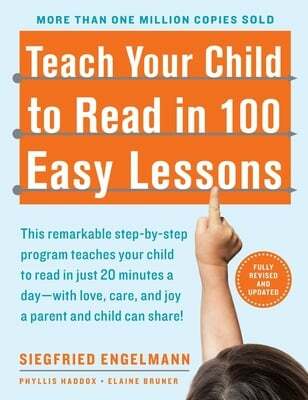 Teach Your Child to Read in 100 Easy Lessons. I have now gone through this book twice and feel confident with both my children's reading. The first time through we did every step. The second time I used this book was with my youngest daughter. She was a little older when we started. Frustrated with the steps, she finally said to me, "Can I just read the words?" So that is what we did. She enjoyed the lessons we did and was quite upset when we finished the book last week. Overall, this is a great book for teaching your child to read. Two things to consider before you start. Make sure your child is old enough and it is OK to not complete every step. I also wanted to point out sight cards that we have used. When my older three learned to read, we had sight cards to review every week. So, I had this index box full of sight cards. I decided to use these cards along with the Teach...100 Lessons. If you are interested in using sight cards, which I recommend. Here is a list of words http://www.mrsperkins.com/dolch.htm These words are called Dolch Words. They are words that may not follow all the phonic rules. My youngest daughter is still working on the primer words. Hooked on Phonics: I ended up adding the books to their reading list. So we did not really go through the program as they suggest. An Ordinary Parents Guide to Teaching Reading: I started my youngest daughter with this. We bought the companion CD and she loved the songs. It helped her with all the letter and blend sounds. We hit a wall when she had to read the small words in the book. This is when I switched her to Teach...100 Lessons. Bob Books: These are simple books that my younger three all read through. They really enjoyed them and they were the first books they read on their own. Explode the Code: I used these books as a supplement. We went through them slowly. I am not sure how much they helped with learning to read.